The picture rail, manufactured by STAS picture hanging systems, is used by the most prestigious museums and galleries worldwide. The STAS art hanging systems, specially developed for museums and art galleries, are distinguished by their exceptional flexibility. 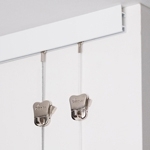 They are not just for hanging heavier art, but also protect your art against theft. 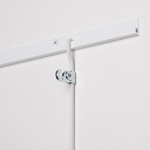 The STAS j-rail is a simple and powerful gallery rail and can be used in many ways. 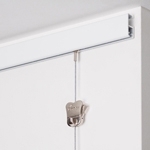 In connection with the hanging rods, the STAS j-rail is ideal for rooms with high walls where pictures have to be changed frequently. The STAS j-rail max gallery rail was developed specifically for heavy paintings. It’s simple and robust. For this reason many art galleries and museums around the world use this system. 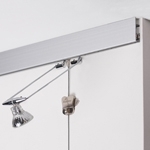 The STAS j-rail max art hanging system is mainly used in professional environments. 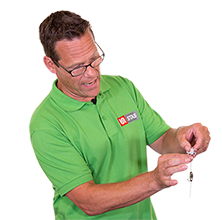 The thick aluminum profile carries loads up to 100 kg (220 lbs) per meter. The STAS j-rail max also provides an additional security system against theft. 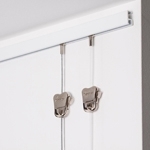 With the help of various accessories, this rail can be transformed into an anti-theft hanging system. 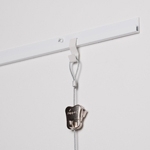 The STAS multirail system is a worldwide patented art hanging system with integrated 12-V electrical wiring. At any desired point you can easily click lighting fixtures into the track, to illuminate your pictures with LED or halogen light.